Those of you who've done live i65 demos with our CMO, Melinda Caughill, probably remember that there's something different about Medicare in the states of Connecticut, Massachusetts, and New York. In these three states, seniors retain a continuous no-questions asked right to get a Medicare Supplement plan long after their 6-month Guaranteed Issue Right is over. Translation... Seniors in these states have more flexibility to change their type of Medicare coverate than people in other states. To accomodate this increased flexibility, i65 has been working on a module specific to the needs of the people living in NY, CT, and MA. We are happy to announce that this new state-specific module is now live on the i65 software. 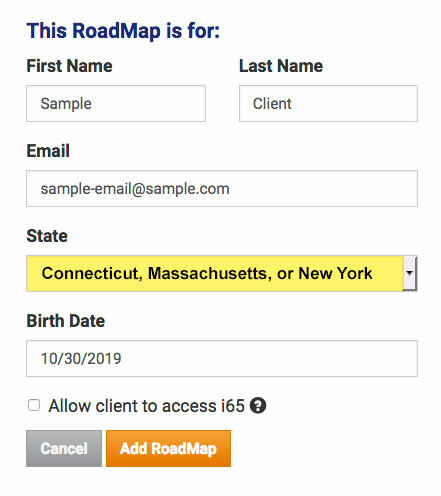 To work with a client residing in one of these three states, simply choose CT, MA, or NY as the state of residence when setting up a client to receive a RoadMap. The i65 system will automatically change the questions asked, the Medicare recommendation made, and the education within the client's final RoadMap report to match the unique state rules. To learn more about the state-specific rules for CT, MA and NY or to get client-specific assistance, pleases contact support or fill out an Ask-an-Expert Q&A request form.